Note: For Xero integrated versions of JuanTax, you first need to create a purchase transaction in Xero for it to sync automatically in your JuanTax account. 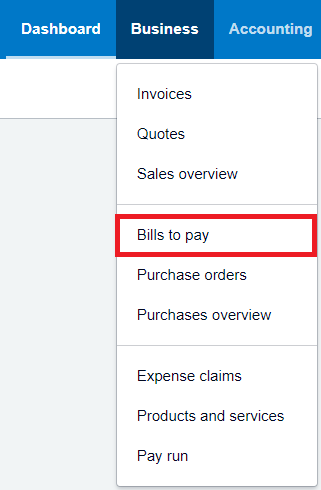 Once you're logged into your Xero account, Go to the Business tab and select Bills to pay. Click the New Bill button and select New Bill in the pull-down menu. Next up is to pay the amount by entering the payment details and clicking the Add Payment button. Go to your dashboard and proceed to Withholding Tax Return, and click the plus (+) icon or hit the Create Report button. Select the Month and Year of your report, then hit Generate. After generating the report it will automatically reflect in the Sources tab.